Home / branding / Brands / Facebook / Marketing / How Credible is Brand Finance Lanka Ltd’s List of Sri Lankan Superbrands? 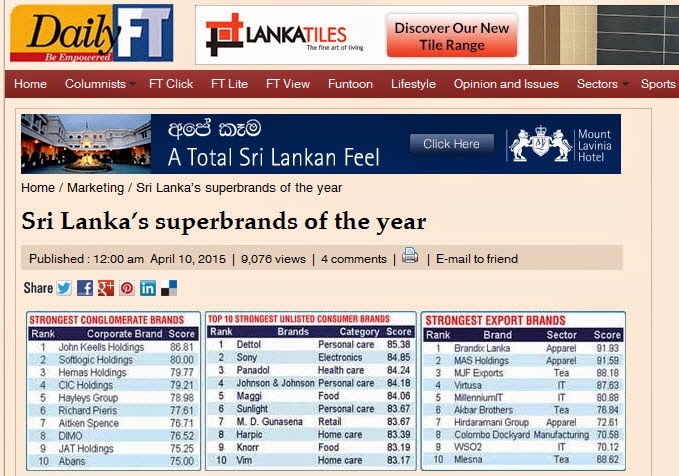 How Credible is Brand Finance Lanka Ltd’s List of Sri Lankan Superbrands? Recently I stumbled upon this article on Daily FT containing a list of ‘Sri Lanka’s superbrands of the year’. The list was published by a company named Brand Finance Lanka Ltd., the local subsidiary of Brand Finance PLC who claims to be the world’s leading brand valuation consultancy. On their website they say, the reports they publish are used for various business needs such as technical valuations for accounting, tax and legal purposes, valuations in support of commercial transactions (acquisitions, divestments, licensing and joint ventures) involving different forms of intellectual property and valuations as part of a wider mandate to deliver value-based marketing strategy and tracking, thereby bridging the gap between marketing and finance. All are valid reasons why the corporate world should access and trust their reports. However, reading through the article on Daily FT I found this interesting list published by them with the title “Strongest Digital Marketing Brands in Sri Lanka”. Managing Director of the company which published this report comments on the achievements of Kapruka and Dialog. All this expert commentary is made about a list they composed using Facebook likes! I have no doubts Kapuka is a great local brand which made a massive progress as a dot com business. Dialog, we all can agree is one of the best case studies of how to build a strong brand. But is “Facebook Likes” the only factor Brand Finance Lanka Ltd could think of as proof to validate the success of Kapruka and Dialog? To compile a list of ‘Strongest Digital Marketing Brands’ a research agency must use better credible criteria than Facebook fan count. Even a grade 10 schoolboy can put up a list like that using the free version of SocialBakers analytics. Is that the quality the corporate world can expect from a world renowned brand valuation consultancy? Ok, assuming that Facebook like count is a strong enough criteria to put up a list like this, now let’s dig deeper into the fan count reported for few of the brands in top 5 brands published in Brand Finance Lanka’s list of ‘Strongest Digital Marketing Brands in Sri Lanka’. From what we can see on this SocialBakers analysis of Dilmah fan base, majority of their fans are from Indonesia, Bangladesh, Pakistan, Cambodia and Egypt. Dilmah being a global brand targeting multiple markets is reasonable to have more non-Sri Lankan fans on their global fan page. However, my little knowledge about Ceylon tea tells me the market for Ceylon tea is largely from countries like Russia, Ukraine, Egypt, UK and Australia. Maybe Dilmah’s international markets are different, and ironically their most popular markets seems to be the same list of countries which are famous for Facebook “Like Farms” as exposed on this YouTube video. That’s about Dilmah and let’s now look at a comparatively a more local brand. I don’t think we have any ambiguity about Mobitel’s target markets. According to this analysis, looks like 28% of Mobitel’s fans are non-Sri Lankans, quite significant amount for a brand predominantly targeting Sri Lanka. If it was 10% we would have concluded it’s by accident, but 28% fans from countries like Pakistan, Bangladesh, and India seems to be something which Mobitel did by choice. About a year ago a blogger named ‘Veritasium’ published this video titled ‘Facebook Fraud’. In this video (which was watched by over 3 million people since uploading) he explains how freelancers based in third world countries like Bangladesh, Indonesia, Pakistan, Egypt, Philippines, Turkey, India and of course Sri Lanka are making money by selling fake likes to brands world over. Go to Fiverr.com and you will find dozens of freelancers who would offer you 10,000 likes for anything you have on Facebook for an investment of just US$5. Maybe the brands listed on Brand Finance Lanka Ltd.’s list have not purchased fake likes from these like farms. But there’s another side to it. They would have most probably targeted their legitimate Facebook ads campaigns to one or more of these geographies. When you set your Facebook ads goal to “more likes for my page” and let Facebook decide where to target your ads, the Facebook ads algorithm will automatically deliver your ads to the users who are most biased to click “Like” button on anything they see on Facebook (based on past behavior). Unfortunately, the fake FB accounts from that third world like farms are doing only one job from morning to night; clicking on “like” buttons. Automatically, your FB ads campaigns now get targeted to the FB accounts created for like farms and they will click on your ad and like your page, just to make sure that there have “variety” in the things that they like (to fool the Facebook system, to show that they are not only liking content from certain FB pages only). In the end, your page will accumulate thousands of fake likes from these farms. If your aim is to achieve that one KPI of hitting X number of fans before your competitor does the same; yes this is an easy tactic to impress your CEO. It’s obvious that the people who composed the list of ‘Strongest Digital Marketing Brands in Sri Lanka’ at Brand Finance Lanka Ltd, has no clue about this reality about Facebook likes. It’s ok to be ignorant about something but it’s not cool to assume rest of the country is ignorant about it too and that’s exactly what BFL did. They would have thought, nobody will suspect the credibility of our list and simply went ahead and published a report without proper substance. Bigger issue here is something else. It’s clear Brand Finance Lanka did a low quality job in selecting the strongest digital marketing brands in Sri Lanka. Then, how can we believe their other lists? What if all their other lists too lacking a mix of credible criteria to evaluate the brand worth? What if those lists too are done in a hurry, by just looking at surface level criteria? Should the corporate world base their business decisions on such a substandard list of superbrands? Where is the credibility?